Nordic's Justin Wilson pulled clear of the field to win his first International Formula 3000 series event in his third year in the class after a chaotic pace car period delayed or penalised all his pursuers. Second could have been so many people, but in the end the trophy was awarded to Jaime Melo from the Durango team with third being eventually claimed by Sebastien Bourdais (DAMS). It was a successfully foray away from Europe for the Formula 3000 circus, the first for many years, at Interlagos in Brazil. Brazilians dominated qualifying with Melo taking pole just ahead of motor racing's new twins, Ricardo and Rodrigo Sperafico. Antonio Pizzonia completed a Brazilian quadrella ahead of Tomas Enge and Giorgio Pantano. The top six were covered by four tenths of a second, with Fabrizio Gollin in 15th within a second of Melo's time. On race day though it all went to pieces. Mario Haberfeld was late out of the pits and forced to start from the back. Trying to make up for a terrible start, Ricardo Sperafico then put the Petrobas car into the wall at turn one, which caused the pace car to be sent out. Upon seeing the yellows and the 'SC' boards Melo slowed suddenly, too suddenly in fact, because Pizzonia, Rodrigo Sperafico and Enge all shot past him trying to avoid a collision. They queued up behind the pace car, but it was soon on again. Melo was swamped as Wilson forced his way through at turn one at the restart. Pizzonia now held the lead from Enge and Sperafico, with a gap to Wilson before Supernova's fast starting Mark Webber trying hard to get past the underpowered Melo. Further back there was comedy as a developing dice between Red Bull teammates Patrick Friesacher and Antonio Garcia ended with both cars off the track, out of the race. Elsewhere Nicolas Filiberti spun in the Prost and retirements claimed Victor Maslov and Haberfeld. The local crowd sensed a 1-2 when Enge dived for the pits. But it was for a stop-go penalty for passing Melo under yellows. A lap later and Pizzonia and Sperafico served similar penalties. This left Wilson alone at the front with Webber finally past Melo and pulling away. Wilson wound down the laps, keeping a steady gap to Webber to at last claim his debut Formula 3000 win. Melo survived to finish a disappointing third ahead of Sebastian Bourdais and David Saelens, with the final point claimed by Joel Camathias. 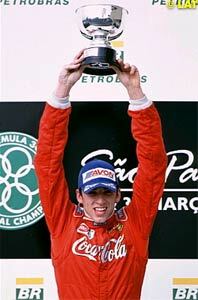 "To win here in Brazil, against the best Brazilian drivers, is very special to me. It is also a great credit to all the hard work that the team has put in for me during our recent tests. To take 10 points from the first race is fantastic and now we can go to Imola in two weeks time with a clear goal - to increase our points in both the drivers and team championships." said the happy Wilson. But it wasn't over yet. Hours after the race, Webber received a 25 second penalty for passing David Saelens prior to passing the start finish line at the restart after the early race pace car period. The penalty dropped the #1 plate holder to 7th and out of the points. The Formula 3000 field travels to Imola, Italy this weekend for Round 2. It takes a long time just to hold 500 Grands Prix. It was perhaps fitting that Honda claimed their 500th Motorcycle Grand Prix win at the track they own, where so many of motorcycle racing's riders of recent years have starred, after a superb ride by Italian Valentino Rossi. The race was a long breathtaking dice which kept the massive crowd entertained. Rossi started to pull clear of the dicing pack by half distance but the minor places went right down to the wire. 500cc rookie Tohru Ukawa looked the goods until falling exiting the chicane with only a few laps to go, leaving Garry McCoy to win the desperate Yamaha battle for second, ahead of Max Biaggi, Norifume Abe and another 500cc rookie, Shinya Nakano. It was Biaggi who won the start to lead into turn one, only to have it taken from him by Loris Capirossi into turn two, setting the tone for the day. Nakano dived under Biaggi into the chicane in a fierce opening lap. Elsewhere Chris Walker and Jose Luis Cardoso had clashed, dumping the pair into the kitty litter. Things were looking miserable for the factory Repsol Honda squad, as Alex Criville got wide and left the track. Criville has had a dreadful off season and from here it would be a struggle to get into the top ten. By lap three the order was Capirossi, Nakano, Biaggi, McCoy, who then took third into turn one on lap four and would have Nakano by the end of the lap as well before blasting past Capirossi to the lead down past the pits, Abe, Alex Barros, the dreadfully slow starting Valentino Rossi and Noriyuki Haga. Nakano was soon through Capirossi as well, this marking the beginning of the Italian's slide down the order. Rossi continued his charge through the field taking the lead at half distance, fighting his way to the front. Once at the front the Honda rider gradually pulled away from a snarling pack of Yamahas as McCoy, Biaggi, Nakano, Haga and Abe fought with the interloping Honda of Ukawa. Biaggi initially went with Rossi but soon fell back towards Ukawa. Lap ten and Haga fell at turn two. Haga was stunned but otherwise unharmed. Ukawa took second as McCoy, running a qualifying rear tyre attacked again have rested his rear tyre, resuming battle in his popular sideways style, bringing Abe and Nakano with him. Ukawa had started to gap the Yamahas when McCoy reeled him in and took the Honda into the chicane with 5 laps to go. A lap later at the same corner, Ukawa lost the back of the bike which then dug in and highsided the Japanese rider. By this time Rossi was gone and he coasted in ahead of the pack of Yamahas. Alex Barros was the next non-Yamaha home ahead of reigning world champion Kenny Roberts Jr on a Suzuki before the troubled pair of Capirossi and Criville. Daijiro Katoh set up the memorable 500th win by winning win number 499 for Honda in the 250cc race. Katoh pulled rapidly away from the group of Aprilia riders to win. Tetsuya Harada and Roberto Locatelli filled the podium places after a desperate dive for the finish line. Down in the 125cc class, it was Honda's day again with Masao Azuma winning from Youichi Ui (Derbi) and Simone Sanna. In California the sun is up 24 hours a day, the beautiful stride the beaches and Brazilians win car races. Helio Castroneves had the perfect weekend at Long Beach, snatching pole on a drying track at the death of qualifying, before taking a flag to flag victory. Castroneves led from the start, challenged by Kenny Brack in the early stages. Brack's Lola-Ford had the straight line speed but not the handling, allowing Castroneves to keep the new 'Super Swede' in check. Following were Cristiano da Matta, Tony Kanaan, Gil de Ferran, a much improved Michel Jordain Jr, Dario Franchitti and Jimmy Vasser. The top eight remained unchanged for the first 29 laps apart from de Ferran taking fourth from Kanaan. With yellows sprouting on lap 30 the front runners dived pitward, but that would be it for Kenny Brack. Brack stalled and then fried the gearbox putting him out. The Penske team put Castroneves back onto the track in the lead with da Matta second ahead of Vasser, de Ferran, Kanaan, Franchitti and Tracy when the top order again settled into processional racing, the only passing move before the next break was Paul Tracy taking teammate Franchitti on lap 49. Five laps later the yellows were out again for two incidents. Max Papis and Patrick Carpentier tangled at turn eight. "Max came out of the pits and was going real slow, maybe 10 mph, and I figured something was wrong with his car so I went to the inside to pass him," explained Carpentier. "That's when he turned down on me and forced me into the speed bump, which launched me into the air and into the back of his car. That really makes me angry because he's the one always talking about safety in the driver's meeting." The impact wrenched the steering wheel from Carpentier's hands, chipping a bone along the way. That coupled with the rotated Scott Dixon at the next corner brought out the pace car. And started the next wave of pitstops. Castroneves held the lead, and da Matta held second, but now Penske's slick pit crew had put Gil de Ferran up into third, past Vasser followed by Team Kool Green and Kanaan. It wasn't a good day for all of the Brazilians however, as a momentary brain fade by veteran Roberto Moreno saw him run up the back of compatriot Mauricio Gugelmin in the pace car queue. From the restart it was a sprint to the finish, with all drivers pushing hard but unable to pass each other. Tracey snuck past Vasser for fourth at the restart. And that was how they finished. "It was a tough race from the start, pretty intense," said Castroneves, "All the race I had it under control, but I couldn't relax at all. The last 25 laps were like qualifying. Sometimes it's good to be the hunter, but I was happy to be in front. I think I go better under pressure. It was a perfect drive, and the team did a great job in the pits. So it was a perfect weekend - pole, lead all laps and win." The performance lifts Castroneves to third in the title chase behind teammate de Ferran with da Matta continuing to lead the series after winning the opening round in Monterrey, Mexico. The CART series next stop is the first Superspeedway for the year, Texas Motor Speedway on April 29. Drivers' standings: Da Matta 37, de Ferran 30, Castroneves 27, Tracy 26, Vasser 18, Andretti, Franchitti and Kanaan 12, Brack 11, Minassian 7 etc. Reigning World Champion Colin Edwards had much to be encouraged about after Round 2 of the World Superbike Championship. At Valencia he hadn't been good enough. At Kyalami he clearly was, winning Heat 1 before retiring from the lead in Heat 2. With Edwards gone from Heat 2, it was the American Ben Bostrom who was generally uncomfortable on the factory Ducati last year who stood tall and took the win. The title is on for young and old and there seems to be no shortage of title contenders. Bostrom won his first Superpole, demonstrating his competitiveness. But it would be teammate Troy Bayliss who would lead the field away with Troy Corser, Edwards (soon to take 2nd), Bostrom, Neil Hodgson and Akira Yanagawa following. By the end of lap two the top four were moving slowly away, while Hodgson defended from the aggressive Yanagawa with Pierfrancesco Chili in seventh and losing touch. Yanagawa was soon through Hodgson and set sail for the leaders. James Toseland was pit bound for a jump start stop-go, and Tadiyuki Okada retired again. While Edwards continues to rack up points, Okada continues to do exactly the opposite, so reliability must be a concern for the Honda squad. Neil Hodgson would also retire with a split oil cooler line. Edwards had passed Bayliss on lap three and was away, with Bayliss ever present in his mirrors, but far enough back that the Australian was never a real threat. Bostrom looked a strong bet for third but Corser kept the rider who replaced him at Ducati at bay and eventually pulled away, to add a third to his two wins from Valencia. Yanagawa never quite caught the top five but had a huge gap to Chili, while a fierce battle for seventh was resolved when Lavilla just beat Laconi to the line. For Race 2 it was Bayliss who got the jump again only to have Bostrom take it from him into turn two. Corser's menacing black Aprilia soon passed Bayliss as well, with Edwards and Hodgson hovering just behind. Yanagawa fell but was OK, far from the first time he'd put down a 'Kwaka'. Edwards was definitely on song, fighting his way past the two Australians called Troy and was rapidly gobbling up the gap Bostrom had built on the field. Further back Ruben Xaus was making up for a poor race one by keeping a close watch on Hodgson for fifth. Edwards finally struck on lap 15 and Bostrom had no choice but to give way, and Edwards was away. But suddenly the Castrol Honda slowed. Okada's problems had spread to his teammate's bike and Edwards coasted in. From there, Bostrom maintained the gap over Bayliss to take his and Ducati's first win of the season. Corser was a fairly lonely third while Hodgson's fourth was never assured, but Xaus and Regis Laconi ultimate failed to catch the Briton. From there it was a big gap back to Lavilla. Corser has kept his championship lead but both Bayliss and Bostrom have closed, and Edwards has more than merely announced his intentions. From here the Superbikes travel across the oceans to the land of the Troy's and the much loved Phillip Island for Round 3. 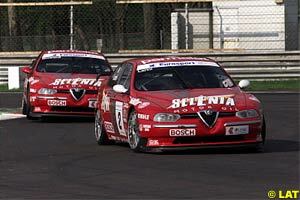 The European Touring Car Championship opened at Monza, and saw honours split between Alfa Romeo & Honda. In race one, the factory Alfa Romeo squad scored a 1-2 result with Nicola Larini leading home reigning champion Fabrizio Giovanardi after a fierce dice for the lead in the latter stages. Third was the Audi Quattro of Roberto Colciago. A comfortable fourth and top privately entered car was the Nissan of Sandro Sardelli who was able to beat the factory Honda of Fabrice Walfisch even after Sardelli picked up a ten second time penalty for short cutting a chicane. Walfisch had been delayed after a clash with the Volvo of Jan Nilsson entering the Rettifilo the first time. Honda's lead driver Gabriele Tarquini crashed out of the race on cold tyres on lap three. For race two, Tarquini would have it all to do, starting from pit lane after a superhuman effort from team mechanics repaired the badly twisted Accord in under two hours. By the end of the first lap Tarquini was tenth. 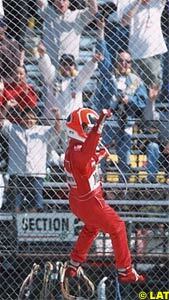 With a lap to go, Tarquini took the lead from Larini. The DNF by Tarquini in race one has given Larini a large points advantage going into round two at Brno. Third again was Calciago ahead of Giovanardi. The second Alfa pilot now holds second from the Audi driver by a solitary point. Fifth was the second Honda of Walfisch. Sardelli was again top 'privateer' having fought clear of a battle with the Alfa of Lancellotti and the Audi of Massimo Pigoli. Nilsson's Volvo was not repaired in time for the main race. The Super Production Race was dominated by BMW with Peter Kox leading home 5 BMW 320i. Duncan Huisman and Gianni Morbidelli took the minors ahead of Norman Simon and Per-Gunnar Andersson with Tommy Rustad the first non-BMW home in his Nissan Primera. Standings:Larini 75, Giovanardi 65, Colciago 64, Walfisch & Sardelli 56, Pigoli 47, Lancellotti 46, Tarquini and Heinrich Symanzick 40, Zadra 39 etc. Super Production:Kox 20, Huisman 15, Morbidelli 12, Simon 10, Andersson 8 etc. Toyota, which recently unveiled its Formula One car, announced plans on Tuesday to get into the Indianapolis 500 by supplying engines to Indy Racing League (IRL) cars beginning in the year 2003. Toyota Motor Sales USA said it would design purpose-built 3.5 liter, normally aspirated engines at its subsidiary, Toyota Racing Development (TRD) in Costa Mesa, California. "Toyota Motor Sales has stated its desire to win the Indianapolis 500 since it first began plans to enter open-wheel racing in 1993," Jim Aust, Toyota Motor Sales USA vice president of motorsports, told a news conference. Toyota's earlier plans to get into the Indy 500 were derailed when the IRL was founded at the end of 1995 and took over sanctioning the race. At the time, Toyota was already committed to the 2.65 liter turbocharged engines for the rival CART formula, which was incompatible with IRL rules. General Motors' Aurora brand and Nissan's Infiniti are currently the only engines in IRL competition. Toyota's plans will bring the number to three in 2003. "Toyota's involvement brings three main benefits," according to Brian Barnhart, IRL's vice president of operations, "increasing competition, increasing (media) exposure, and reinforces the stability of the series. "Clearly, this is about growth," he said. The announcement also could signal the beginning of discussions for a common formula for the rival CART and IRL open wheel series. "CART rules makers are the only people that can make that decision," said Lee White, group vice president and chief executive officer of TRD. "We hope that this will come to pass. But it's up to CART," he added. Engine regulations for the CART series for the 2003 season and beyond are still under debate and are due to be announced in the near future. Earlier this year, Toyota's Japanese parent company unveiled a Formula One car that will make its racing debut next year. April 27 sees the launch of the new Sylvester Stallone motion picture, 'Driven'. 'Driven' tells its story against the backdrop of the Fedex CART Championship Series. Originally to be filmed around Formula One, the movie was switched to CART after negotiations with Formula One power brokers broke down. The movie stars Stallone as a veteran driver brought in to settle a young driver played by Kip Pardue. The film also stars Burt Reynolds, Til Schweiger and Stacey Edwards. NASCAR continues to roll its juggernaut across the USA. Dale Jarrett is starting to assert his superiority in this year's series collecting two wins in a week at the Harrah's 500 at Texas Motor Speedway and the Virginia 500 at Martinsville Speedway. Jarrett now leads the series on 1236 points from Jeff Gordon (1113), Sterling Marlin (1049), Johnny Benson (1049) and Steve Park (1039). The opening round of the FIA GT Series has been won by the Lister Storm of Jamie Campbell-Walker and Tom Coronel who lead home the Chrysler Viper of Christophe Bouchut and Jean-Philippe Belloc ahead of the Vipers of Vosse/Derichebourg, Belmondo/Defourny and the Ferrari 550 of Blieninger/Duez. Argentine farmers are putting pressure on the country's government to cancel the Rally of Argentina due to concerns the WRC circus, which consists mainly of British and French based teams, may spread Foot and Mouth disease to Argentina. For the moment the Government is resisting interfering with the event. Factory Citroen Xsara driver Phillippe Bugalski is being investigated for alleged use of illegal pace notes on the Rally of Catalunya.